It’s mid-summer, so let’s enjoy it while it lasts. This is how the SoilMatrix Garden looked on Thursday, July 27, 2017. The romaine at the front corner is being consumed (by us). It is also being invaded by the zucchini (must remember not to plant so much of it next year). 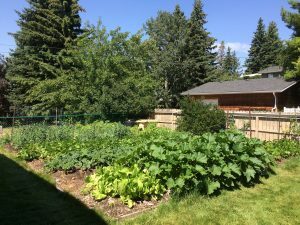 Once again, this garden is receiving no chemical fertilizers, pesticides, or herbicides and as little city of Calgary water as possible. We are attempting to bring the soil health up to a level where all of these inputs are happening below ground level via our soil life food web friends. In this newsletter we will provide a few links to research that indicates the various benefits of biochar soil amendments. I spent some time compiling these for your learning so you can read for yourself how biochar amendments make a difference to your flower and/or vegetable garden. where you will find free downloads of Chapter 1 as well as a recently written free download by Dr. Paul Taylor. Biochar is a natural soil ingredient, which is found in soils in most parts of the world. The principle of improving soils with biochar has been tried successfully in many places over thousands of years. Plant production has been found to increase significantly after biochar additions to soils. In some cases negative effects have also been reported… see these in the “disadvantages” below. Biochar produces a “liming effect” to balance acidic soil towards a neutral pH. Biochar has an affinity for adsorbing contaminants and keeping them out of harm’s way for plants. Microbial habitat improvement and protection is offered by biochar’s presence. Moisture and nutrient retention improvements are evident as a result of biochar’s ability to both absorb moisture and adsorb nutrients and retain them longer. Increases in mycorrhizal fungi abundance is observed – these are fungi that are linked to plant productivity. Increases in earthworm abundance are observed. The use of biochar is well documented for only a few geographical locations. Much more research is needed to fully understand its benefits or disadvantages in soils around the globe. Soil loss by erosion can be an issue when top dressing biochar to soils. This occurs by wind and/or water transport of small, light biochar particles. Proper incorporation into a soil blend is necessary. Risk of contamination of biochar exists (PAHs, heavy metals, dioxins) when contaminated feedstocks are used and/or the process conditions used to make the biochar are such that temperatures are greater than 500 C are used. Residue removal for use as a feedstock for biochar production could result in reduced incorporation of crop residues into soils and potentially lead to negative effects on soils. This would be the case if farmers were to use all of the straw produced in a field to make biochar, for example. Extremely high rates of biochar application could have negative effects on earthworm survival rates; however this would be in cases where application rates are greater than 67 kilograms per square meter of land – an impractical level of biochar application. Emperical evidence is extremely scarce (at this time) for many modern biochars in soils under modern arable management. The ability to sequester carbon in soils amended with biochar is still largely unquantified and requires further research. Biochar’s effects on the nitrogen cycle depend on many factors which have not yet been fully explored. Biochar benefits may be crop and soil dependent, which may be an issue given the irreversibility of biochar once applied to the soil. Distribution and availability of contaminants that are adsorbed by biochar (heavy metals, PAHs) require further research to assess the rate of bioavailability and toxicity of the contaminant depending on the biochar type, application rates, feedstock, production conditions, soil types, and environmental conditions. More research is needed to fully map the life cycles of biochar’s effects on soil organic matter. Issues of pore size and connectivity and the optimum particle sizes for biochar that is amended for soil enhancement still requires research. Soil water retention and availability requires further research for variations in soil type. Effects on larger soil organisms – such as contact of skin with biochar in soil for larger organisms. This is still in the early days of research. Hydrophobicity of biochar in soils remains largely untested. Rate of decomposition of biochar as a function of agricultural management requires further research. There is a good potential that biochar can improve “Cationic Exchange Capacity” of soil – a facilitator of nutrient uptake by plants. However, the effectiveness and duration of this effect after addition to soils remains poorly understood and requires long term experimentation. Given these point form benefits, negatives, and unknowns, there seems to be much more in the “unknown” category, which is the reason for the huge interest in this topic at leading research institutions around the globe. Much more will be discovered about biochar in the coming years. It could makes for an exciting career for budding agronomists, biologists, and soil scientists. We hope to keep you informed as the results from all this research becomes available. Thank you for your interest in this topic. We will see you again at the end of August.